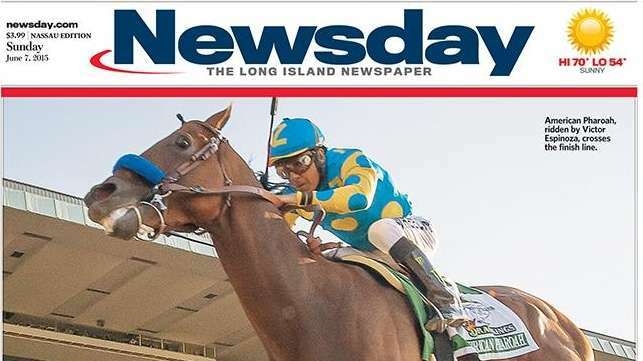 J. Conrad Williams' shot of American Pharoah winning the Belmont Stakes was selected for the front cover of Newsday on Sunday, June 7, 2015. Human athletes often are fast. Horses are much faster, presenting special challenges for photographers. "There's nothing like shooting horses," said J. Conrad Williams Jr., who has been taking pictures for Newsday for 30 years and on Saturday captured American Pharoah winning the Belmont Stakes and the Triple Crown. It was an image that graced the front cover of the newspaper and received national acclaim. "They look like they're running in slow motion [as they approach], but then it happens so fast,'' he said. "You have to be thinking: This is going to come and go, and it's over. It's a weird, emotional feeling, because I see it and I'm just catching the beauty of it and the excitement and then it's done. You think: Did the cameras fire? Was it in focus? It's a burning feeling in your stomach until you get it back and into the computer." 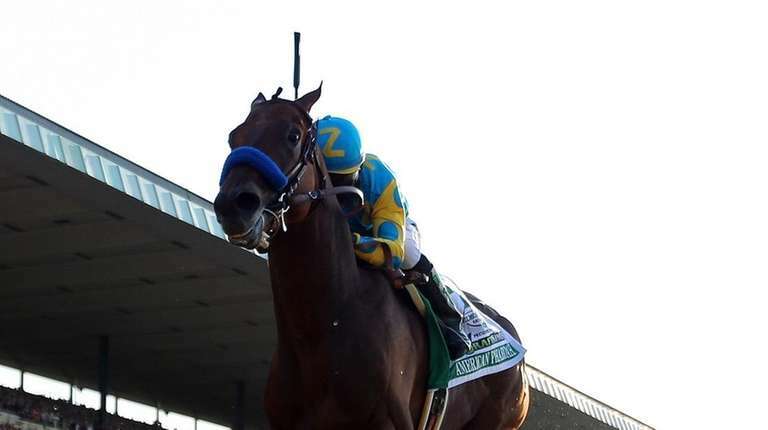 The reason he was not sure what he had is that the Nikon D4 that shot Pharoah from a low angle in all his sinewy glory was about 50 feet away from where he was standing with other photographers on risers set up near the finish line. Like many of his colleagues, he held a camera in his hands while simultaneously controlling two cameras placed just above ground level near the track with a foot pedal. His first decision was at what angle to place the ground-level cameras. The next involved timing and focus and, as he said, "a lot of guesswork." Photographers set up the remote cameras, then lay wire to connect them electronically, making sure to cover everything with dirt so no one trips. Williams used two remote cameras. Some media outlets had only one, others four or more. Once the horses reach a predetermined mark, the pedal goes down and the camera fires at 10 or more frames per second. "It was about knowing when to step on that foot pedal and remembering to hit that foot pedal," he said. "As soon as the race is over, I take the card out [of the camera] and run inside and that's it." When Williams did see the image on the computer, he said: "I thought it was a very good shot, but I did not think it was the cover. We had seven photographers working with us and came up with some really great moments. You just never know what the guys inside are thinking." This time it was a no-brainer.